The “Scandale” popping up in pink font on the cover of this CD refers to the 1913 premiere of Igor Stravinsky’s ballet The Rite of Spring in Paris, performed here in the composer’s version for piano duet. Never mind that the scandal – adroitly masterminded by impresario Sergei Diaghilev – had in fact more to do with Vaslav Nijinsky’s unconventional choreography than with Stravinsky’s music – the score survived unscathed, yet Nijinsky’s choreography was never seen again, until its resurrection in 1987 for the Joffrey Ballet. 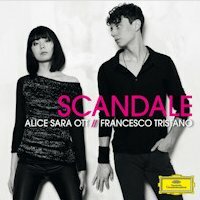 Pianists Alice Sara Ott and Francesco Tristano team up in what primarily looks like an homage to the visionary genius of Diaghilev and an extraordinary group of creative artists, who caused a hundred years ago with the Ballets Russes a shockwave in the arts world – one that clearly still ripples on. Categories: CD reviews | Tags: Ballets Russes, Deutsche Grammophon, Francesco Tristano, Igor Stravinsky, Marc Haegeman, Maurice Ravel, piano music, Rite of Spring, Sacre du printemps, Scandale, Sergei Diaghilev | Permalink. There is no way to escape it: on May 29 it will be exactly a hundred years ago that Igor Stravinsky’s seminal Rite of Spring was premiered in Paris, as part of the famous Ballets Russes seasons masterminded by Serge Diaghilev. While the fascination of dance-makers with the work has never diminished since its notorious creation at the Théâtre des Champs-Elysées – very few scores have been so frequently choreographed throughout the years or triggered man’s boundless imagination – the centenary promises plenty of concerts and music-related events commemorating the Rite. For that matter, one of the most original renditions were to be found at London’s Royal Festival Hall where the complete Rite could be heard whistled in the lavatories – courtesy of Joao Penalva. Categories: Concert reviews | Tags: BOZAR, Claude Debussy, Igor Stravinsky, La mer, La Valse, Le Sacre du Printemps, Marc Haegeman, Maurice Ravel, Rite of Spring, Rotterdam Philharmonic Orchestra, Rotterdams Philharmonisch Orkest, Yannick Nézet-Séguin | Permalink. The weekly BBC Radio 3 Lunchtime concerts at London’s Wigmore Hall feature much-loved international artists and young, up-and-coming performers from the BBC New Generations scheme. The many portraits decorating the Green Room at Wigmore remind us that practically all the great soloists in the business have performed here at some point in their career. Yet lunch with Khatia Buniatishvili is not an easy thing. The program proposed by the Georgian pianist on February 11 for a sold-out Wigmore was anything but a rush lunch at your nearest fast-food joint. For its mere 60 minutes it was quite a copious meal, food for thought as it were, taking a while to digest but eventually paying off. In fact, with playing this focused, relentlessly intense and passionate, insightful and quite stunningly virtuosic to boast, it was sheer delight. Categories: Concert reviews | Tags: Buniatishvili, Chopin, Frédéric Chopin, Khatia Buniatishvili, La Valse, Marc Haegeman, Maurice Ravel, piano, Ravel, Wigmore Hall; BBC Lunchtime Concerts | Permalink. As part of the Brazil Festival in Amsterdam, which offers for two months a rich sample of art forms ranging from dance, visual arts, film and architecture to economics, gastronomy, theatre and music, the Royal Concertgebouw Orchestra conducted by Iván Fischer programmed a remarkable concert of, well, not Brazilian music, but at least music partly inspired by it. More than anything, however, it was a marvelous opportunity to see and hear a great orchestra letting its hair down and sharing a great deal of fun. Categories: Concert reviews | Tags: Boléro, Concertgebouw Amsterdam, Darius Milhaud, iván fischer, Koninklijk Concertgebouw Orkest Amsterdam, Le boeuf sur le toit, Manuel de Falla, Marc Haegeman, Maurice Ravel, Nelson Freire, Noches en los jardines de España, Pavane pour une infante défunte, piano, Royal Concertgebouw Ochestra | Permalink.